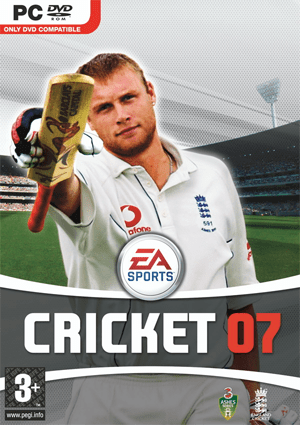 Cricket 07 MUI is a cricket simulation computer game from EA Sports, which, like its predecessor Cricket 2005 was developed by HB Studios.Thanks to the groundbreaking EA SPORTS Century Stick control system, batting has become more intuitive, responsive and rewarding than ever. For the first time in a cricket game, players can enjoy full control over foot choice, shot, direction, power and timing, all governed through the use of both analog sticks. A back or front foot stroke is selected with the left stick, then shot timing and direction are judged with the right stick. Power is determined by how far the stick is moved, a slight tap can nudge the ball for a quick single or a firm push can send the ball fizzing away to the boundary. Allied to new cameras that deliver a more natural behind-the-stumps batting perspective and a wider view of the field, cricket has never been so easily accessible. With embellished gameplay, a wealth of tournaments, genuine equipment and authoritative new commentary from Mark Nicholas and Richie Benaud, you wont experience cricket this authentic without donning whites and walking down the pavilion steps yourself. All links are interchangeable. Thus, if one server is down, you can download the remaining parts from other hosts. Refer to our guide section if you are new to downloading games in parts. this is the biggest and best game i play!